50 x 72 x 5 in. Each: 24 x 20 in. 10 5/8 x 10 5/8 in. 25 x 28 1/2 in. 25 x 26 1/2 in. 73 x 34 1/2 x 34 1/2 in. 87 x 10 x 11 in. 72 x 57 x 23 1/4 in. 18 x 9 1/2 x 9 1/2 in. A Line Can Go Anywhere surveys the use of fiber as the primary material in the work of seven Bay Area artists. 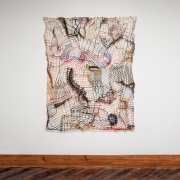 Practitioners of what has historically been called fiber art, all of the artists use linear pliable elements such as thread, yarn, string, monofilament, and rope. While not a movement in the conventional sense, Bay Area artists working with linear pliable elements were and continue to be radical makers working among more celebrated movements such as Bay Area Figurative Painting, Funk, and Pop. Including works made between the 1950s and the present, A Line Can Go Anywhere begins with two artists whose works serve as a primer for a history of art making in Northern California. Trude Guermonprez and Ed Rossbach were influential artists and teachers whose work, though too little known today, contributed to a categorical transformation of art and craft. A Line Can Go Anywhere connects these two key figures to works by Josh Faught, Terri Friedman, Alexandra Jacopetti Hart, Ruth Laskey, and Kay Sekimachi. 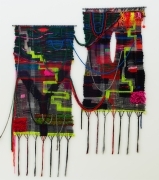 The term fiber art encompasses both the use of pliable materials and the techniques used to construct art works, primarily knotting and weaving. The included works, whether conceived at an intimate or large scale, revel in the plasticity and potency of fiber. Crisscrossing generations, nationalities, processes, and approaches, the works speak to the cultural forces and art discourses that have contributed to a rich, and often overlooked, legacy of art making, from the initial efflorescence of the international fiber revolution of the 1960s to fiber’s recent reclamation by contemporary artists who, in an expanded field of art, create fiber-based work with a kind of “post-fiber” awareness. A snapshot of material, place, and sensibility, A Line Can Go Anywhere traces networks among artists that range from teacher-student, to material processes, to conceptual approaches. The exhibiting artists call home a part of the country that, since mid century, has been a locus for radical cultural and political changes. Studio Craft, the civil rights movement, hippie counterculture, feminism, shifting gender roles, and bold educational and art institutions took root at the western edge of the Golden State. Specifically, both Northern and Southern California hosted in the early 1970s significant fiber-related exhibitions featuring artists whose work transformed fiber from a material suitable to industry and craft to one capable of extending the categories of modern and contemporary art. A Line Can Go Anywhere showcases some artists working at what might be considered the center of the periphery while also highlighting the work of a new generation of artists committed to the material and conceptual potential of fiber. Josh Faught (b. 1979 St. Louis; lives San Francisco) makes sculpture and wall works with all manner of objects and processes, mixing cultural codes of high and low. Party Favors collides a shadow weave pattern with piano keyboard fabric and a shopping list of novelty items, among other items—all of which Faught devotedly lists in the medium line. Such work celebrates fiber history and technique while destabilizing the category of craft. Faught deploys abstraction like a smoke screen behind which he loads references to queerness, hobby culture, and “othered” communities—whether gay histories, fiber art, or the often overlooked Pattern & Decoration movement. But at the core of so much of Faught’s work is the process of collecting, and the preservation and presentation of archives, especially ones in danger of disappearing—like those of generations of people lost to AIDS and those coping with that legacy. Trude Guermonprez (b. 1910 Danzig, Germany; died 1976 San Francisco), a European weaver trained in the Bauhaus tradition, emigrated to America in the late 1940s to join her family at Black Mountain College. Guermonprez taught weaving at the college, assuming Anni Albers’ classes during a sabbatical in 1947, and alongside Albers from 1948 to 1949. Guermonprez relocated to Northern California in 1949 to teach at Pond Farm Workshops, a working community of crafts masters led by potter Marguerite Wildenhain. Guermonprez made experimental weavings alongside commissions for industry and private clients, and from 1952 until her premature death in 1976, she taught at the California College of Arts & Crafts in Oakland (now California College of the Arts) where she instructed and influenced countless artists and weavers. 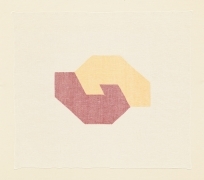 Guermonprez’s abstract weavings demonstrate her allegiance to Bauhaus principles of material and process, as well as weaving’s associations with painting. Calico Cat (1953) is a personal work that pays homage to a painting she owned by Paul Klee, as well as her love of cats. (Kay Sekimachi bought this work from the artist.) Guermonprez’s weavings, restrained in both subject and palette, transitioned into larger and more experimental forms in the 1960s just as the fiber art movement took off. Her space hangings marked a departure both in color and form, and above all related to sculpture. Notes to John I and II (1966) show her progression into text and symbols, a shift in her oeuvre but very much a reflection of new modes of incorporating text in art inspired, in part, by the counterculture. In 1974 Alexandra Jacopetti Hart (b. 1939 Preston, Idaho; lives Sebastopol, California) completed a now legendary public play structure entirely of knotted rope in Bolinas, Californi. Macrame Park was her own initiative, made with volunteers, and it remained in use throughout the 1970s. Its making and “premier” are documented in Ben van Meter’s rarely seen documentary film, itself a period piece of a time and place. Jacopetti Hart is also a weaver working in the tradition of tapestry. Her monochromatic Nebulae imposes the endless grid structure of the loom onto pliable elements. Like others who pursued anti-materialist lives, Jacopetti Hart sewed and embroidered her clothes as a means of thrift, repair, and self-expression. She made elaborately embroidered garments, even co-founding Folkwear Patterns for home sewers and needleworkers. Sensing a groundswell, she and photographer Jerry Wainwright co-published a book celebrating Bay Area contemporary fashion and folk art. Native Funk and Flash (1974) was extraordinarily popular and though out-of-print continues to inspire artists and craftspeople. Ruth Laskey’s (b. 1975 San Luis Obispo; lives San Francisco) loom weavings are formal exercises in line and color, figure and ground, structure and surface. Laskey studied painting but, dissatisfied with applying paint to canvas, she began to weave her own blank canvases on which to paint before embracing the painterly qualities of weaving with color. 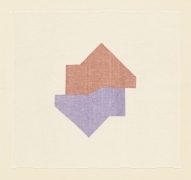 Like her predecessors Anni Albers and Trude Guermonprez, Laskey explores and expands the limitations of thread and loom. The strength of Laskey’s work is in the structural rules she applies to its making. 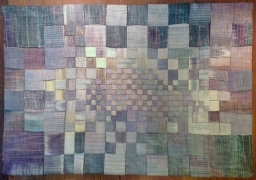 She limits herself to linen, dye, and the twill weaving pattern (a diagonal that diverges from plain weave’s right angle grid). Works are titled after the commercial dyes used to tint the thread. Laskey works in series, with each new body of work proposing either a relationship between a straight line and a diagonal, two interlocking colors, or shifting degrees of diagonals. Though two dimensional and optical, Laskey considers her works objects that embrace both painting and sculpture. Ed Rossbach (b. 1914 Chicago; d. 2002 Berkeley) should be classified as a fiber postmodernist for his devotion to the textile traditions of worldwide cultures. His work references everything from ancient textile fragments to Mickey Mouse, all the while exploring structure and form. Like Funk and assemblagist artists, Rossbach used newspaper, found objects, garbage bags, and plastic novelty trinkets, among other non-art materials. He reveled in humble and atypical materials, courting awkwardness and anti-form, to create one of the most diverse bodies of work to be categorized as fiber. But unlike some fiber artists who made large scale work to attain parity with sculpture, Rossbach was ever faithful to intimate scale, to restless experimentation, to wry humor, to handcraft. His works in this exhibition demonstrate a range of techniques and scales, from basketry to knotless netting, looping, lacemaking, and jacquard. Despite being a prolific maker, writer, and a professor at the University of California, Berkeley, between 1950 and 1979, Rossbach, by his own choice, seldom exhibited or sold his work. Still, his impact on generations of artists is profound. Kay Sekimachi (b. 1926 San Francisco; lives in Berkeley) studied with Trude Guermonprez during summer sessions at CCA in the 1950s. 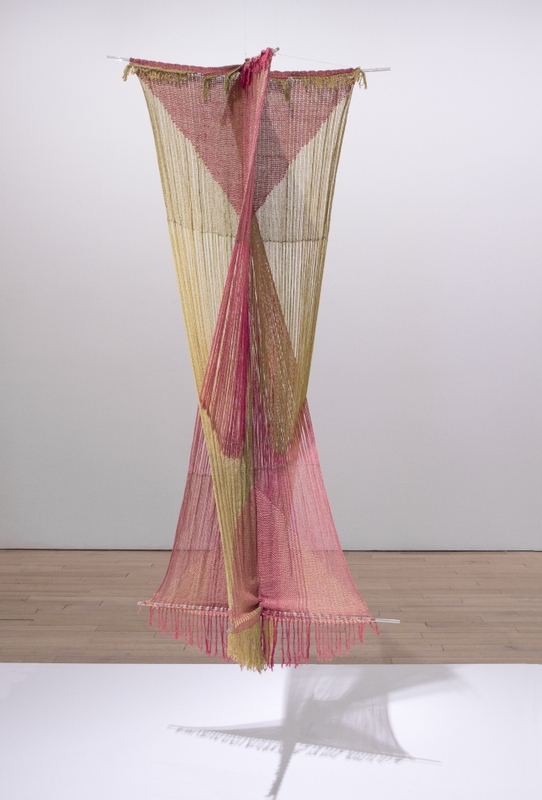 Though Sekimachi had studied art and weaving intermittently for years, her work was charged by Guermonprez’s pedagogical emphasis on both free experimentation and the rational logic of weaving. Sekimachi’s early double weavings demonstrate a gifted facility with harmonizing opposites: density and translucency, complexity and simplicity, technique and free expression. She began to make sculpture in the 1960s just as the international fiber movement was taking shape. Between 1964 and 1974 she used monofilament to make a series of sculptures that hung in space—a galvanizing break with pictorial weaving’s wall-bound condition. Made on multi-harness looms, the sculptures were limited in color to black or white. For seven decades Sekimachi has worked with pliable elements, especially monofilament, thread, and paper, making experimental works that fold together Japanese and American traditions. 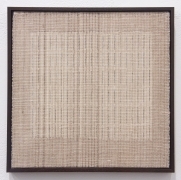 Her recent series of small-scale, subtle weavings pay homage to painter Agnes Martin. Note: The title of this exhibition honors Ruth Asawa, another Bay Area artist who worked with linear pliable elements. She said of her favored material, “I was interested in [wire] because of the economy of a line, making something in space, enclosing it without blocking it out. It’s still transparent. I realized that if I was going to make these forms, which interlock and interweave, it can only be done with a line because a line can go anywhere.” Though Asawa’s work could not be secured for this exhibition, her work and its logic are essential to the history and sensibility of the Bay Area. Asawa is the subject of a solo exhibition on view at David Zwirner Gallery. Jenelle Porter is an independent curator in Los Angeles. From 2011 to 2015 she was the Mannion Family Senior Curator at the Institute of Contemporary Art/Boston where she organized the acclaimed “Fiber: Sculpture 1960–present,” as well as monographic exhibitions of Arlene Shechet, Erin Shirreff, Mary Reid Kelley, Jeffrey Gibson, Jessica Jackson Hutchins, Dianna Molzan, and Christina Ramberg, among others. 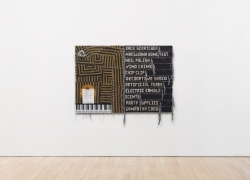 Porter has worked as a curator for over twenty years, including positions at the Institute of Contemporary Art, Philadelphia, Artists Space, Walker Art Center, and the Whitney Museum of American Art. Please contact Jeffrey Waldron at jwaldron@jamescohan.com or 212.714.9500 with press inquiries. For further inquiries regarding the exhibition, please contact David Norr at dnorr@jamescohan.com or 212.714.9500. "A Line Can Go Anywhere"